click: Choose a rezzed piece of ice. That ice gains sentry, code gate or barrier until the end of the next run this turn. Yeah, I know the common objection : it costs 2 MU and is click intensive. But if you compare it to another 2-MU, yet popular, Shaper program, namely Magnum Opus, a Paintbrush click can be much more worthwhile than a Magnum click, if not as versatile. For instance, go through a Komainu with a Yog.0, through an Hadrian's Wall with a Faerie or a Dagger, or through an Archer with a Cerberus Lady. Now, there are a few things to consider when using Paintbrush. First, you need some very efficient breakers to go with it, some that make a whole range of ice worthless. If you want to use it for making of Gordian Blade a Corroder, you get it wrong. Gordian with Corroder is a much better choice. But if you go with Yog.0, now every single ice with strength lower than 4 is now one click away. If you want to use Paintbrush, take breakers that can break many subroutines, or strengthen high, for few credits. See Yog.0, Refractor, Dagger, Faerie, Switchblade, Morning Star, or any Cerberus. Then you can expand these powerful breakers to every subtype instead of just one. Second, don't rely on only one breaker, but instead two. It's better if one of these is a killer, because you'll need to facecheck before using Paintbrush. Choose them so they complete each other outside of their ice-subtype of choice. For instance, one should be good to strengthen, the other to handle subroutine-heavy ices, like Dagger and Morning Star. Or one should be set for low strenght ice, the other for higher strength, like Yog.0 and Faerie. It's hard to fit 3 Paintbrush-compliant breakers in a deck since such programs tend to need support (recursion or stealth source, mainly), but don't deny a classic breaker to handle your missing subtype, or even a IA. Third, you must find a way to earn clicks when it's needed. In a Shaper deck, All-Nighter is a good solution. Imagine you're playing Kit. Here's a pattern of a last turn you may meet more often than not, if not in every game : Paintbrush, Indexing, All-Nighter, Paintbrush, Paintbrush, Run R&D. Or : Paintbrush, run a remote and bounce an unrezzed piece of ice, All-Nighter, Paintbrush, Paintbrush, Run remote again. It can be very surprising, if you're opponent forgot you installed All-Nighter few turns ago. Also, it goes well with tutor, as you might expect. When needing your missing breaker, consider to get your Paintbrush instead. It's not always the right choice, but it can be as disruptive as a Test Run+Femme Fatale. 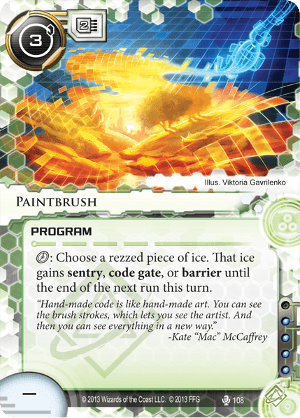 In conclusion, Paintbrush is a tricky card, so fun to play, that can be devastating if well used. Decks based around have to be finely driven but it's worth it. tl;dr : Paintbrush is tricky, but with the right breakers, it's very good.